For Kathy and Dennis Pinto, marriage has been all about love, romance and wine ... lots of wine. The two met while dining out with friends and hit it off right away. Six months later, after a whirlwind courtship, they were married and living in Kathy's Sayreville condominium. "I think my mother sent him to me," Kathy said, noting that the night in the restaurant was the first time she had gone out since her mother had died. "She had cancer and I had been caring for her for months." The two happily settled into a routine. Kathy was a hairdresser at a salon in Manalapan. Dennis was a wine salesman and traveled the tristate area. Unfortunately, three years into their marriage, the company where Dennis worked went out of business. Together, the two turned a loss into an opportunity. Dennis had done well as a wine salesman, so they began to consider starting their own wine import business. "One night we sat down and started thinking it through. It just felt right, and we thought 'We can do this,'" Kathy recalled. The two knew they would need help, so they turned to Dennis' friends of 35 years, Lindsey and Ro Piazza, of Long Island, N.Y. Soon, the four had set up a partnership, chosen a producer and decided on a name — La Vendemmia Importers Inc. "La Vendemmia means the time when they harvest the grapes," Dennis noted. In the beginning Lindsey, Dennis and Kathy all sold wine, and Lindsey and Dennis delivered it. In 1996, their first full year, they sold 4,500 cases of wine. Ten years later, in 2007, they sold 75,000. Pinto thinks one of the reasons for the success of his wine is the producer in Italy — Vinicola Botter. "It's the third-largest family-owned wine producer in Italy. Their wine maker is one of the best in the country. Producers come from all over Italy to learn from him," Dennis said. The other is the presentation. In 2003, Kathy redesigned the label and sales took off. "We had a square label with our logo of a woman carrying grapes from the field. Kathy changed it to an oval label and enlarged the logo. She also changed the color of the borders with each different type of wine," Dennis said. The brand has also had its share of fame. In 2005, it caught the eye of Peter Gianotti, food and wine editor of Newsday, who has written several articles touching on their wine. The same year, The Star-Ledger picked their Primitivo, a red wine from the Puglia region, as its "Holiday Pick" from Italy. But that was only the beginning. "One day I was visiting one of my customers, and he said to me, 'I just saw your wine on Rachel Ray's [show],'" Dennis said, referring to the Food Network talk show. "I was really shocked. I guess she needed a bottle of wine for the show and her assistant picked out mine. I sent her two cases with a variety of our wines, and it's been on the show six times." Dennis noted another point of pride. "We are also the unofficial, official wine of the Wise Guy show on Sirius Satellite Radio." The show stars Vincent Pastore and John "Cha Cha" Ciarcia from "The Sopranos." Dennis was on their Christmas show. "I was explaining to people what wine goes best with certain foods," he said. The couple is looking forward to another successful year. Originally, five types of wine were sold under the La Vendemmia label — Pinot Grigio, Chardonnay, Cabernet, Merlot and Prosecco. Today, the label offers 25, including "the only white zinfandel from Italy." And while Dennis still sells wine, he also has a staff of salespeople and six delivery trucks. Both Dennis and Kathy are amazed at their good fortune, but it hasn't changed their lifestyle or their attitudes. "I feel so lucky," Kathy said. 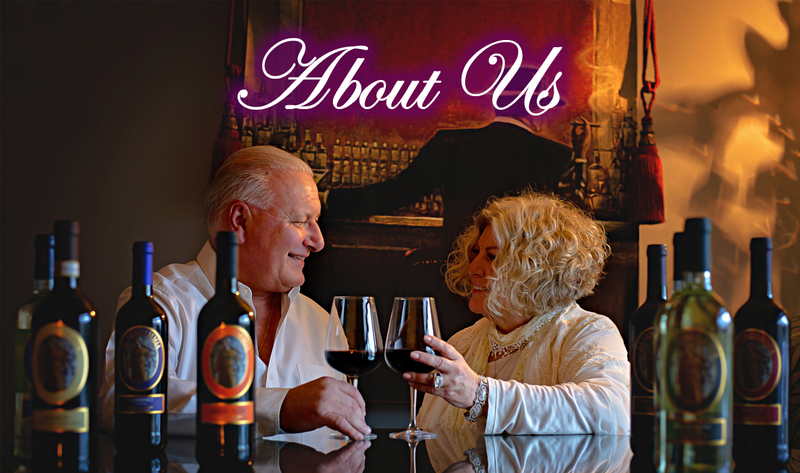 "The business has been successful and we are still happy together. We are like peanut butter and jelly."